Physical characteristics: The American dipper is also called the Mexican dipper, the water ouzel, and the waterthrush. It is 6 to 7 inches (15 to 17.5 centimeters) long. 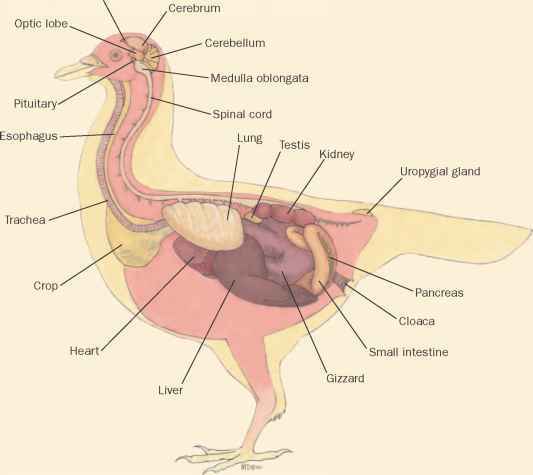 The male weighs 2 to 2.4 ounces (57 to 66 grams), and the female weighs 1.5 to 2.3 ounces (43 to 65 grams). Its body is slate gray with a paler throat. A flap covers their nostrils to keep water out. 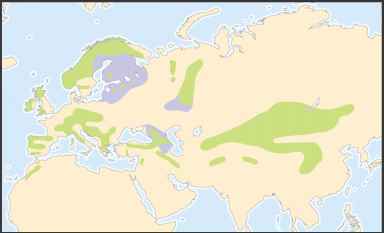 Geographic range: They are found along the western coast of North America from the Arctic Circle, through Canada and into Oregon, Washington, and California, as well as in central Mexico and Central America. It is also found in Arizona, Nevada, Colorado, South Dakota, and Wyoming. Habitat: The American dipper prefers cool climates and high altitudes, up to 11,000 feet (3,500 meters) in the United States. One group even endures the severe winters of Alaska and South Dakota, which can drop to 40° below zero F (—40°C). Diet: American dippers walk along the bottoms of stream beds, totally submerged, hunting for insect larvae, worms, and snails. Sometimes, these birds will fly along the surface of the waterway, scooping up flies and other insects. They will also weed out sluggish insects from snowbanks and seaweed cast upon the shore. Behavior and reproduction: This species of bird behaves like most other dippers. Its song is melodious, with a sharp "dzik-dzik" call that occurs anytime, not just to attract a mate. Mating occurs from May to July. 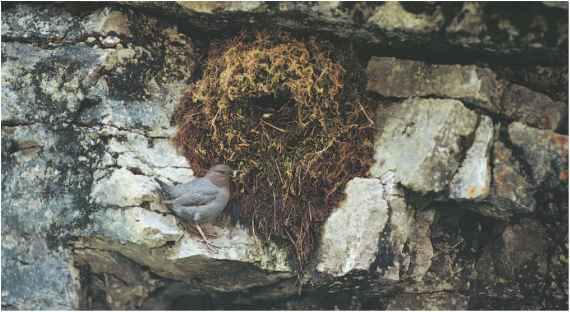 American dipper nests are spherical, about a foot in diameter with the usual side entrance. North American birds lay four to five white eggs, but Costa Rican birds will lay only two to four. Incubation by the female takes fourteen to seventeen days. The young fledglings are fed by both parents for twenty-four to twenty-six days. American dippers and people: This species has been accused of causing damage to fish hatcheries, though no evidence has been found. Conservation status: American dippers are not threatened or at risk of dying out. They are very sensitive to the water quality of the rivers and streams near their nests and will abandon them if they become polluted. Mining has contributed to water pollution in regions where American dippers nest. Bird populations are often supported and may even increase in numbers by the introduction of nest boxes placed near streams by humans and by American dippers using the undersides of bridges over waterways as nesting sites.